Second, can I admit something? Newsweek has recently instituted something in its magazines--a weekly page called The Technologist, where Steven Levy talks about new digital advances, new consumer technologies on the market, etc., etc. Well, there is also a recurring item on this page called "Blog Watch." While I feel absolutely ludicrous saying this, each week I open the magazine and wonder if WWYG?! will be mentioned. Isn't that the stupidest thing that I have ever committed to disk space on this blog? (At least until I type a little further in this post.) It wouldn't be so bad if every week there wasn't mention of someone's blog that is hosted by Blogger on blogspot. Never mind that Blogger (owned by Google) is probably the most widely used hosting area by the blogging public. It's one-stop shopping, the Ford of the blog-o-verse. I mean, if I started here, then that tells you something. But I digress . . .
Third, I must confess that today was an interesting day at work. I found out that I am in charge of a great deal of stuff for the next several months (and when I mean a lot, I mean EVERYTHING). While most of my departmental colleagues are planning ahead for another year down the road, I have been given management of all the products to be completed by the start of January. While the total number of items seems large (and the myriad of details and items to track and complete IS large) the volume of completely brand new stuff is not so daunting--or so I chant softly to myself starting . . . NOW. 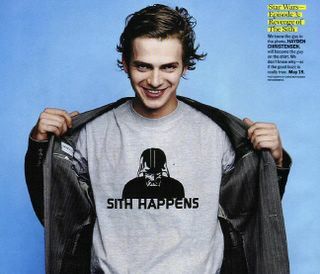 On the front, this image of Vader's head and the phrase "Sith Happens"
On the back it could say "Join the Dark Side: Burb-a-palooza 2K7"
1. All Surly Burb, all the time. 2. Please Burb, don't hurt 'em. 3. Sweater vests and crack for everyone! 5. Burb-a-palooza . . . if not now, when? 6. You say tomato; I say booyah! You say potato; I say booyah! 7. 2007: My year (and therefore your year) in HELL! 9. Burb-a-palooza: It makes the Third Reich look cuddly! So, yeah . . . I didn't say they were any good, just that I had thought about it. But I've got other ideas. I found a cardboard Burger King crown that my kids recently picked up and was trying to think of a funny way to work the idea of a crown into the whole humiliating effort when I noticed a web-site printed on the side of the crown above the weirdly shaped cartoon characters. Since I am unable to pass up the chance to visit an unknown website, I checked it out. It's rather odd, but honest in its efforts to brainwash.